The hardware of the iPad 2 is hardly a game-changer. They didn't upgrade their display from the first generation iPad (which always looked a little bit pixelated to me), though they did make it thinner and lighter. They added a front facing camera, a faster, dual-core processor, and the expected dose of cool buzz-words and trash talking of competitors (digs were taken at the XOOM's price and the small amount of Honeycomb-specific apps available). Stevie even tried to frame the iPad 2 as the "first dual core tablet to ship in volume," which seems like a bit of marketing wordplay. In other words, they did all of the things that Apple does best. It will work just fine: millions will be sold, Android loyalists will fume, and Apple fans will be happy and feel cool. In other words, it will be business as usual. But it wasn't the iPad 2's presentation today that will change things, it was another announcement that could go almost unnoticed next to their newest, shiniest iProduct. What was it? The precipitous drop in price of the original iPad to $399. This could have enormous repercussions in the tablet market as a whole. Performance-wise, some of the Android tablets released over the last four or five months have been very impressive. We Android fans tend to appreciate specs and performance, and most of the major Android slates have delivered. The Galaxy Tab was a solid start in a smaller form factor, the XOOM is a geek's dream machine, the LG G-slate matches that and will add 3D to the mix, and the HTC Flyer is going in a completely different direction - toting a stylus and sporting the HTC Sense overlay. Android fans have been given great hardware and a variety of options that will only continue to grow. What those loyal to Google's OS have not been given as much of is a competitive pricing point on these tablets. The Galaxy Tab debuted at $600, the XOOM a staggering $800 off-contract, and it looks like LG's slate will be in the $700 range (no details as of yet on the Flyer's cost). The biggest factor driving these absurd costs is that the tablet manufacturers are apparently making deals with wireless carriers that prevent us from getting Wi-Fi-only options out of the gate. It seems clear that the marketing strategy of Android slate makers all starts with looking at what Apple is doing. They look at Apple's offerings, improve on the specs, raise the prices a bit, and put them on the shelves. Up to this point, what Apple was doing was selling a tablet that started at $500 for a 16GB Wi-Fi model. Today, Apple is now selling that very same tablet for $100 less. This is what the Motorolas, Samsungs, and the LGs of the world will be forced to acknowledge and react to. Why? Because tablet customers will now have that option on the table. 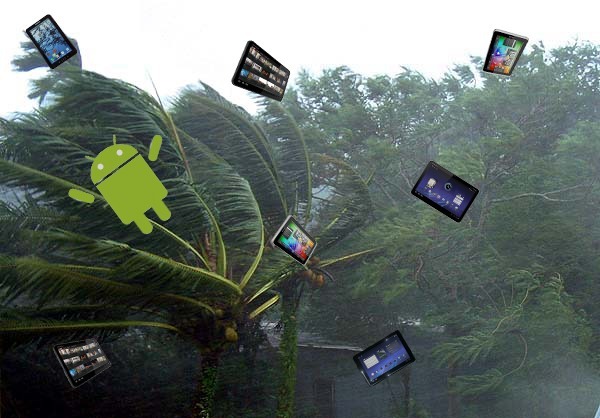 They will buy it, and many will turn down Android tablets in favor of the more economical, well-known and loved iPad. Up to this point, the only tablets priced below $500 were either mid-grade attempts from lesser manufacturers (Viewsonic, Archos), or a $250 eReader that needs to be hacked in order to provide the functionality of an entry-level tablet (ala the Nook Color). While techies can get excited to greater or lesser degrees about these options, they don't do much to affect the market as a whole. With the iPad priced at $400 (even though it is the previous generation model), the most popular tablet by a very large margin has now broken that $500 barrier. To your average customer, Motorola is looking pretty bad now with its $800 XOOM. 3D is fine and dandy, but $700 ain't gonna cut it, LG. You can bet that the decision-makers at these major corporations were paying close attention today, and if they don't adapt, their tablets may be doomed to a fringe existence, mere wanna-bes watching Apple dance at the Prom while they sit alone popping their pimples. How will this play out? Nobody knows for sure yet, but I see the iPad 1's price drop as being the first major assault on the ridiculous pricing of Android tabs we have been forced, and apparently will continue, to deal with. Let's keep our fingers crossed that the execs at Motorola, Samsung, LG, etc. will be paying attention and making wise decisions.